Dreams are mysterious and crazy things. Sometimes you’ll have a dream and have no idea of what to make of it. Songs simply about dreams, even sort of romantic cliched ones, are sometimes enough just to trigger those feelings of the novel, the unexplained, and the otherworldly. Such is the case with the 1958 Felice and Boudleaux Bryant penned classic, “All I Have to Do Is Dream” performed by the Everly Brothers and Chet Atkins, (on guitar.) 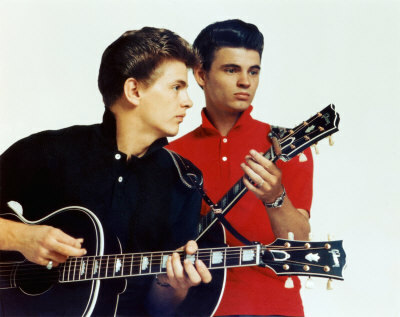 Don and Phil Everly, are still out there today, singing their unique brand of 50s dream rock, living legends found unstoppable by age or changing trends. The song is an intoxicating whirlpool of perfect close vocal harmonies, and proto-psychedelic lyrics about love and dreaming. In the performance below you also get “Cathy’s Clown,” their gorgeous 1960 hit that really ensnared John Lennon of Beatle fame in its beautiful structure. Speaking of the Beatles, the Everlys were always listed as a MASSIVE influence on John and Paul, and all you gotta do is see the video below to guess why. Two boys singing pop with flawless harmony as if it was second nature. The Beatles just took that as a device and added it to their already killer repertoire of songwriting and performing mastery. As a bonus, I’ve included a demo by John in the 70s of him trying out his own version of “Cathy’s Clown.” It’s brilliant and sad. Enjoy. Powered by WordPress v 5.0. Page in 0.437 seconds.